We live in a creative age: with each new year comes technological advances, and there’s no shortage of innovation within the hotel industry. As hotel trends keep getting better over time, they continually improve the guest experience and let travelers act upon their naturally curious and innovative natures. It all comes down to building greater interaction between guest and hotel, and these new features for 2018 are positively changing the way people travel. Hotels are finding new ways to build communication between the guest and the room itself, where guests can transmit their messages through voice-activated mechanisms and in-room app settings. Just the idea of using guest apps is novel on its own and can create constant communication, as needed. For instance, travelers can control temperature and lighting settings through apps, which are easily accessible over mobile. What’s more, some hotels offer built-in voice control features, such as with Alexa, who can submit requests throughout the hotel and keep you comfortable and attended to 24/7. She’s there to answer any questions and get you whatever you need, as quickly as possible. Hotels are also looking into robots and other technological personalities to engage guests in play. 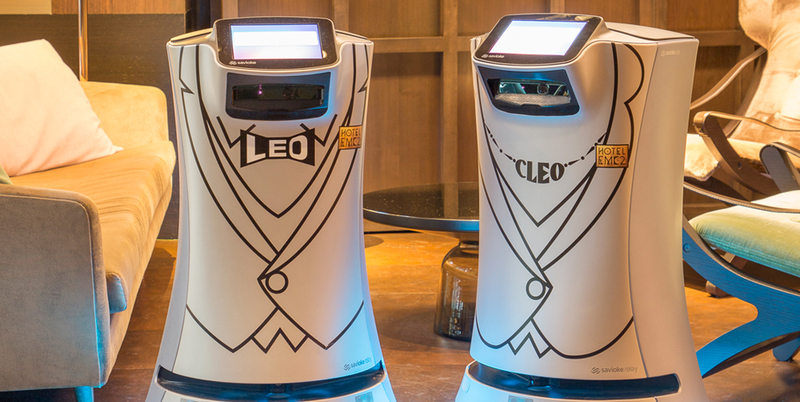 For instance, at our hotel, robots Leo and Cleo satisfy guests, where they can deliver room service, bring up toothbrushes and other items guests may request through Alexa, and greet guests in the lobby upon arrival. These robots provide a modern, innovative aspect to hotels that can make the stay more enjoyable and interesting overall. And, they’re practical, as they service guests and attend to their needs. Many hotels are also looking to integrate art, creativity, and technology into the guest experience, where travelers can feel inspired during their stay. For example, at our hotel, there are music amplifiers in the rooms, so guests can listen to music through a science-and-art inspired design for improved and magnified sound. Similarly, hotels are looking to create unique experiences for guests, ones they can’t find elsewhere. This is achieved through interactive videos that might show up in conference and meeting rooms or elevators. Plus, meeting spaces are also becoming more advanced, as they are fully equipped with the latest technology so business travelers, especially, can be productive and stimulated while away. Many hotels are collecting information about guests before they check in, where guests can create their own profiles and provide personal details through the hotel’s CRM system. This way, hotels can tailor guests’ visits to their liking, including features that will match their preferences. You can think of the hotel as being a “smart hotel,” one that’s intuitive and able to understand each guest’s unique character. Out are the days where a room key must be inserted to open the door. Beginning last year, hotels have been using more advanced technology to make travel smoother and more convenient. Room keys have become electronic, making entrance easier, but now they might disappear in physicality altogether. For 2018, people will be able to open their doors with a guest app that’s on a mobile device—much like scanning a barcode at an airport. What’s more, check-in and check-out is becoming more automated where hotels are adding app features for easy accessibility on mobile. This time-saver frees hotels up from basic tasks, so they can better service guests throughout the day and improve the overall traveling experience. Need a place to stay when traveling to Chicago? Book your reservation now.